[Shenzhen, China, 6 January 2011] Huawei, a leader in providing next-generation telecommunications network solutions for operators around the world, today unveiled the Huawei IDEOS™ X5, the most recent addition to the IDEOS™ family of smart devices. Featuring the latest email, document, and calendar management tools and the powerful Android™ 2.2 operating system, the X5 is an ultra-sleek touchscreen device that redefines convenience and productivity for today's busy professionals. From hardware, software to product design, each detail of the Huawei IDEOS X5 is specifically chosen to bring consumers a smart mobile experience that is easy to enjoy. The Huawei IDEOS X5 is a stylish smartphone that packs outstanding performance, design and technology into one compact device. The Huawei IDEOS X5 offers high speed connectivity through HSPA and WiFi 802.11n, enabling professionals to stay connected at all times and places. It has 4GB memory and a SD card slot that allows more applications to be installed and stored. The smartphone's 5MP camera and 720p high-definition video recording and playback features keep entertainment at the fingertips. "In today's always-online world, the line between personal and professional life is blurring. Smartphones play an important role in helping people mange these two aspects of their lives conveniently and simply," said Victor Xu, Chief Marketing Officer of Huawei Device. "The Huawei IDEOS X5 smartphone offers a perfect blend of style and technology that allows busy professionals to respond to work issues in real time while staying connected with loved ones and having fun at the same time." The Huawei IDEOS X5 is the newest smartphone in the IDEOS™ portfolio of smart devices. 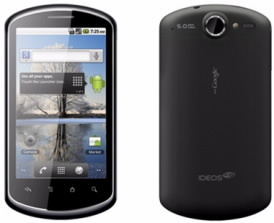 Launched in September 2010, the first IDEOS smartphone has sold more than one million handsets in over 70 countries within 2 months after launch. The Huawei IDEOS X5 will be available in Singapore, Hong Kong and New Zealand from January 2011, with other countries to follow.